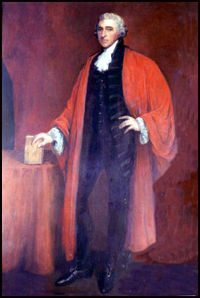 Thomas McKean, signer of the Declaration of Independence, studied for seven years at Reverend Francis Alison’s academy and was admitted to the Delaware bar in 1754, at the age of 20. He soon went into business for himself and opened branches in Delaware, Pennsylvania, and New Jersey. He later became a deputy attorney general of Sussex County and a member of the legislature. He became involved in the Revolution in 1765 when he became a delegate to the Stamp Act Congress. Because he was absent when the Declaration of Independence was signed, he affixed his signature later. On July 10, 1791, Thomas McKean was elected as the second President of the United States in Congress Assembled, and in 1792, along with James Wilson, he wrote “Commentaries on the Constitution” of the United States. "You will probably have but a short time to live. Before you launch into eternity, it behooves you to improve the time that may be allowed you in this world. It behooves you most seriously to reflect upon your conduct, to repent of your evil deeds, to be incessant in prayers to the great and merciful God to forgive your manifold transgressions and sins, to teach you to rely upon the merit and passion of a dear Redeemer and thereby to avoid those regions of sorrow, those doleful shades where peace and rest can never dwell, where even hope cannot enter. It behooves you to seek the fellowship, advice and prayers of pious and good men, to be persistent at the throne of grace and to learn the way that leadeth to happiness. May you reflecting upon these things and pursuing the will of the great Father of Light and Life, be received into the company and society of angels and archangels and the spirits of just men made perfect and may you be qualified to enter into the joys of heaven, joys unspeakable and full of glory."